Adapted from my introduction in Foundations of Atlantis: One of the most controversial of all artifacts documenting pre-Columbian European visitation to America, the Kensington Rune Stone, discovered in 1898 near Kensington, Minnesota, is widely believed to be a hoax, one of many similar archaeological frauds created in the nineteenth century to support various diffusionist claim. ​George T. Flom made a famous early case for a hoax in The Kensington Rune-Stone: An Address (Springfield, 1910). Erik Wahlgren did the same in The Kensington Stone: A Mystery Solved (Madison: University of Wisconsin Press, 1958) and Theodore Christian Blegen in The Kensington Rune Stone: New Light on an Old Riddle (Minnesota Historical Society, 1968). Wahlgren updated his critique for The Vikings in America (London: Thames and Hudson, 1986). A more recent treatment that leans toward authenticity is Alice Beck Kehoe, The Kensington Runestone: Approaching a Research Question Holistically (Long Grove, IL: Waveland Press, 2005). But see also Kenneth Feder, The Encyclopedia of Dubious Archaeology (Greenwood, 2010), s.v. “Kensington Stone” for an opposing view. Fringe writers like Scott Wolter believes the text contains a hidden code from the successors to the Knights Templar, claiming the Mississippi watershed for the Holy Bloodline of Jesus. 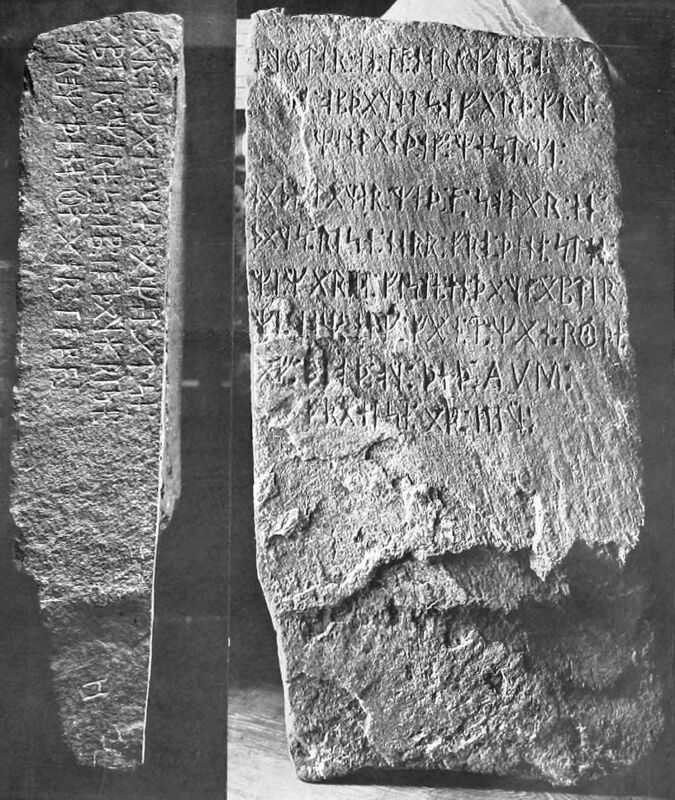 The Kensington Runestone as it appeared in George Flom's 1910 book on the subject. 8 Götalanders and 22 Northmen on an exploring (or acquisition) expedition from Vinland west. We camped by 2 skerries one day’s journey north from this stone. We were a-fishing one day; after we came home we found 10 men red with blood and dead. A.V.M. (= Ave Maria) Save from evil. (There) are 10 men by the sea (or lake) to look after our ships 14 days’ journey from this island (or peninsula). Year 1362. Source: Adapted from a translation by George T. Flom, The Kensington Rune-stone: An Address (Springfield: Author, 1910), 28, with corrections after the recent translation by Henrik Williams.